Based off of the same name manhwa series, Scholar Who Walks the Night falls squarely into the ever popular sageuk fusion Korean drama genre. 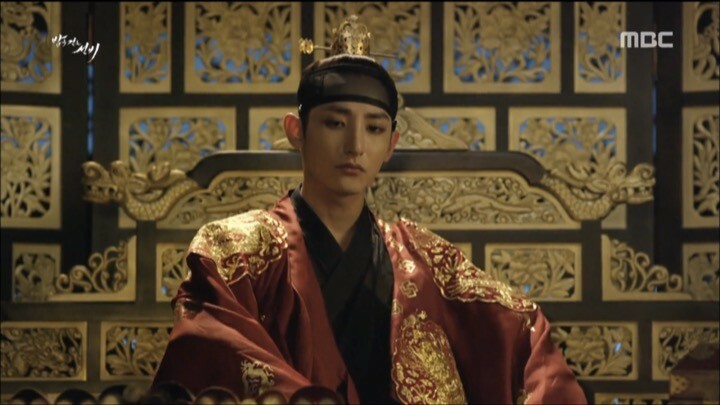 It marries the ancient Joseon culture of the East with the blood-sucking vampires of the West to create a never-been-done-before fantasy story — a story centered around freeing the country and its people from the controls of a merciless vampire Gwi (Lee Soo Hyuk). This drawn-out battle with Gwi requires the combined efforts of many: scholar Kim Sung Yeol (Lee Joon Gi), who got turned into a vampire but manages to hold onto his human heart, bookseller Jo Yang Sun (Lee Yu Bi) with a shocking birth secret, and crown prince Lee Yoon (Shim Chang Min), whose determination in saving his people leads him to join hands with Sung Yeol and Yang Sun. Of course, another big focus of the storyline is the inevitable romance and twisted fates between Sung Yeol and Yang Sun. With such unique combinations of characters, lofty premise, and dreamy settings of Joseon dynasty, Scholar Who Walks the Night seems to already possess the recipe for success. Nonetheless, I was disappointed to find that the drama ended up being just like its pretty yet empty shelled vampires — beautiful on the outside, hollow on the inside. Beneath the whimsical cinematography, fancy wardrobes, and charismatic acting performances, Scholar Who Walks the Night is a mess full of plot holes and forced tropes. It’s a shame as the drama could have been so much more with a tighter storyline and fewer filler scenes. For what it’s worth, if you’re not bothered by the lapses of logic in the plot and ambiguity in the characters’ abilities, then the drama may just be a picture perfect fantasy to dwell in. The drama could have been so much more with a tighter storyline and fewer filler scenes. The opening episodes of Scholar Who Walks the Night are full of intense adventures and surprising cliffhangers. Not only are we introduced to the mysterious and dark world of Gwi, we also learn about his connections to the royalties. Along the way we meet many characters, some more ephemeral than I had expected. The story begins with crown prince Jung Hyun telling his best friend Kim Sung Yeol about a vampire who appears in the king’s quarters and frivolously drinks the concubines’ blood. Turns out, Gwi was invited by the royal family’s ancestors 200 years ago to help establish the Joseon dynasty. In exchange, Gwi was promised that subsequent generations of kings will forever serve him. 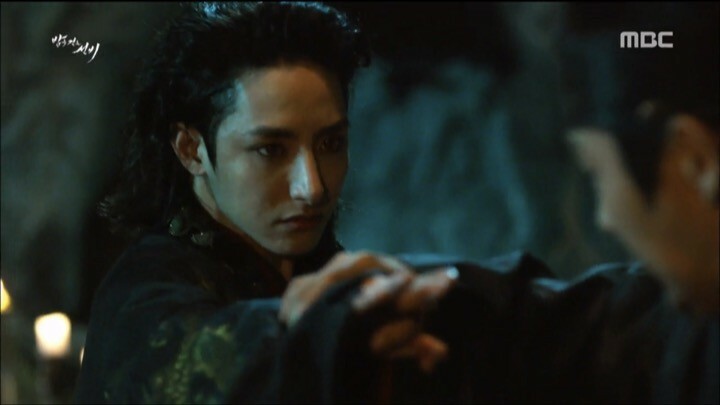 But fed up with Gwi’s brutal ways, prince Jung Hyun finds a secret way of destroying him and records it in his journal. 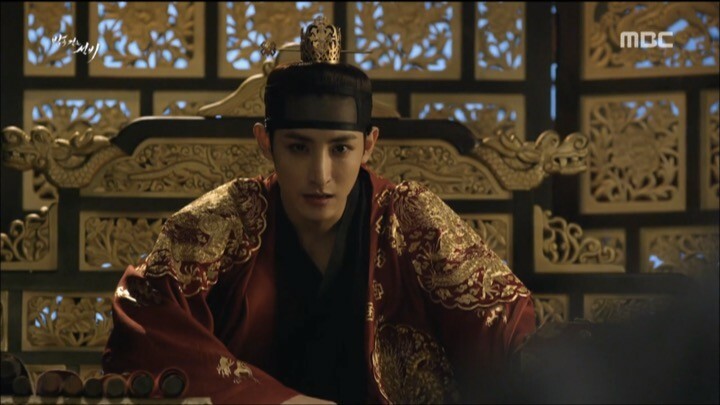 Gwi overhears the prince’s plans and ruthlessly persecutes those who are involved, including Sung Yeol. After witnessing the death of his parents and his betrothed lover Lee Myung Hee (Kim So Eun), Sung Yeol barely lives on to seek revenge and complete prince Jung Hyun’s will. He gets bitten by a vampire hunter who also passes onto him two important items: a knife that can kill any vampire and a black garment that can shield him from the sun. So, Sung Yeol begins his new life as a vampire and I’m as excited as ever to watch his journey unfold. Fast forward 120 years later, Sung Yeol is still looking for prince Jung Hyun’s lost journal so he commissions the capable bookseller Jo Yang Sun to help find it. At the same time, he looks into the identity of an imposter using prince Jung Hyun’s pen name “Forbidden Quest”, thinking that this person knows about Gwi and the whereabouts of the journal. 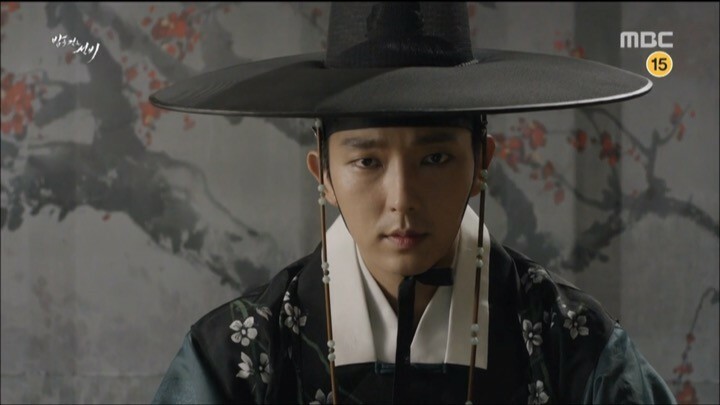 Separately, we’re introduced to the current crown prince Lee Yoon, who seems to be a carefree youth on the outside, but is secretly resentful of his father’s unjust death due to defying Gwi. He meets Yang Sun and immediately takes an interest in her because she reminds him of his long-lost childhood friend. Unsure of what Yoon has to do with anything yet, I chose to temporarily cast him aside. But just when I thought we’re done meeting all the key characters, I’m as shocked as Sung Yeol to see his old love ‘Myung Hee’ roaming about the streets. Who is she and what could this all mean? In what feels like a whirlwind of complicated events, the core premise of the storyline has been set up and the main cast is established. Though it was difficult to keep track of the myriad of characters and figure out the purposes they each serve, I was most definitely intrigued by their elaborate connections to each other and how this imaginative story has unraveled thus far. The next few episodes of Scholar Who Walks the Night primarily focuses on developing the romantic interests between its main characters. Drawn to Sung Yeol at first sight due to his beauty and his uncanny resemblance to the fictional character — ‘The Night Scholar’ — that she’s obsessed with, Yang Sun immediately develops feelings for him. After a few times of being saved by Sung Yeol, she is completely mesmerized by him and ends up confessing to him while intoxicated, thinking that it was a dream. I have to admit that it was one of the most dreamy confession scenes in recent memory — visually stunning with whimsical ballad playing in the background that could melt anyone’s heart, including Sung Yeol’s. It was one of the most dreamy confession scenes in recent memory. Yet Sung Yeol has no choice but to intentionally distances himself from Yang Sun by sending her away because he knows that they’d never be able to have a meaningful relationship. Of course, Yang Sun doesn’t understand why and feels hurt. The escalating emotional tension between our main characters is easily the highlight of the drama at this point. While the romance begins to takes off, the main arc advances at a slower pace than I would have liked. The drama does reveal some surprising information about the true identities and intentions of the characters, but not without much waiting around. Picking up from the cliffhanger of the previous section, I was quite taken aback to find that the Myung Hee look-alike is Choi Hye Ryeong (Kim So Eun), who was sold to Gwi by her father in exchange for political gains. Gwi’s intentions in keeping her around is none other than to trap Sung Yeol by leveraging her similarities to Myung Hee. On the other hand, Sung Yeol closes in on who Forbidden Quest really is and decides to help him. 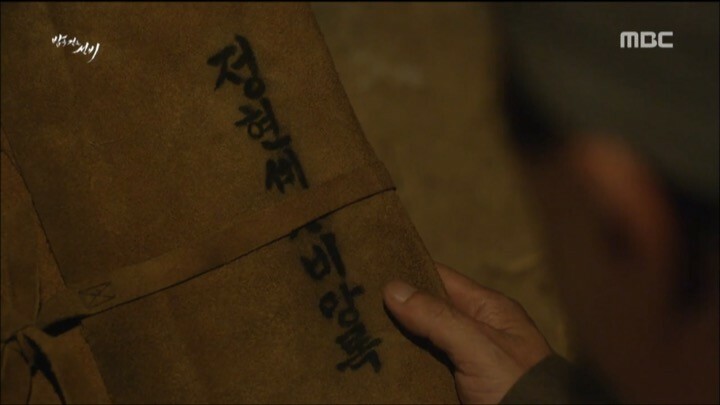 We also obtains clues about prince Jung Hyun’s journal through a few unexpected supporting characters that I mistakenly deemed as unimportant early on, namely Yang Sun’s foster-father. These unanticipated twists help redeem the dragging plot development and maintain my patience for the drama. 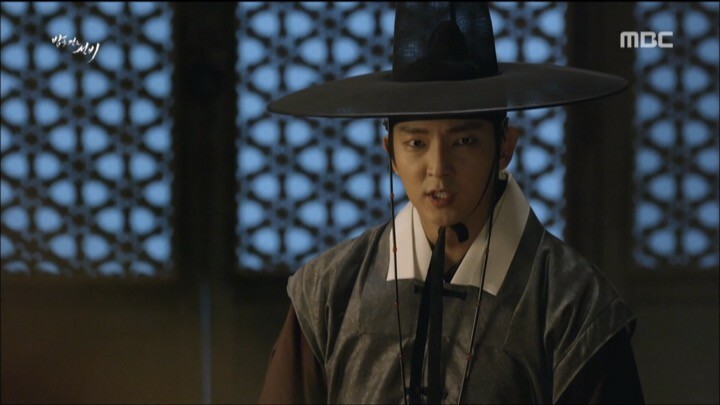 As reward for sticking through the previous slower episodes, Scholar Who Walks the Night amps up the storyline on a few fronts and begins to crystalize the secret way of destroying Gwi. Specifically, the main arc develops towards an unforeseen direction and quickly rebounds my interest in the drama. In order to protect the real Forbidden Quest, Yang Sun and her foster-father conveniently became scapegoats. Knowing that he won’t be able to make it out alive, Yang Sun’s foster-father decides to entrust Yang Sun and the journal to Sung Yeol. While deeply moved by the collective emotional pain conveyed during Yang Sun’s persecution thanks to our cast’s fantastic acting, I’m also anxiously waiting to find out what the journal actually says. Meanwhile, there are other startling revelations about key characters’ past and more context around their motivations without giving everything away. For example, the drama finally confirms Yang Sun’s real identity after dropping hints throughout earlier episodes. Yet it still manages to keep us guessing why her past has to be hidden and how it’s related to the main objective of the drama. Furthermore, the current king, or Yoon’s grandfather, has been painted as a cruel figure who sacrificed his own son to please Gwi, or so we were led to believe. But little did we realize until now that the king did everything to protect Yoon and has been preparing his own way of combating Gwi in secret. This sub plot turns out to be a crucial device smartly placed to lead into a bloodshed battle that helps push the fight with Gwi onto a new chapter. Last but not least, Hye Ryeong proves to be yet another character not to be taken lightly. It’s quite obvious that her eagerness in wanting to become the queen and Gwi’s trust in her will serve important roles in future episodes as she carefully manipulates Gwi and Sung Yeol to get closer to her goal. 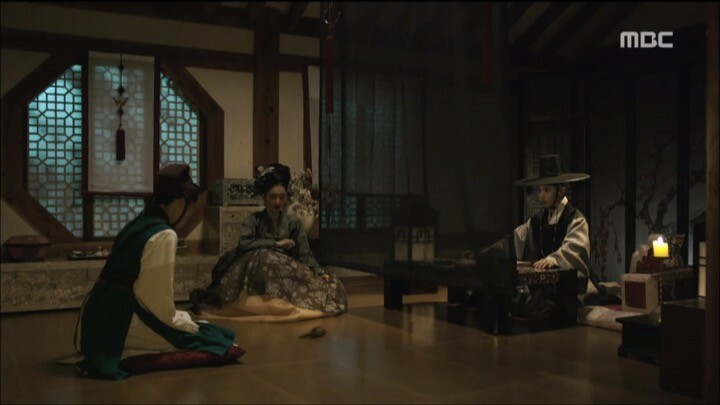 With such great set up in the previous section, Scholar Who Walks the Night suddenly slows things way down again, much to my dismay. It’s as if the writers realized they still have half of the drama left and felt the need to ration the remaining storyline. That’s not to say the plot developments here are not interesting, but that it was a true test of patience waiting for anything significant to happen. In five episodes, the only important contribution to the main arc is Yang Sun’s relation to Gwi and why she’s important in defeating him. The rest of the time involves spreading this news about Yang Sun from one character to another and then duking out who gets to keep her. Yes, Yoon does become the king after his grandfather’s plan fails and pretends to succumb to Gwi; Yes, Hye Ryeong does become the queen and begins to rebel against Gwi; Yes, Yang Sun and Sung Yeol do confirm their love for each other. But all of these events could have been easily wrapped up in half the time without all the filler scenes and repeated flashbacks. With artificially extended storyline comes sloppy writing that creates many plot holes and lapses of logic. The most prominent example has to be the inconsistency and ambiguity around Sung Yeol’s vampire powers. In one case, he gets significantly injured by a gun while we know that he can self-heal. In another occasion, he manages to crawl under the sun without his protective garment for who knows how long in desperation to rescue Yang Sun. Noble, but I must question how he managed to do that when Gwi gets severely injured by even a little bit of sunshine. With a draggy storyline comes sloppy writing that creates plot holes and lapses of logic. Yang Sun also could not escape a self-contradictory fate. When she first found out about Sung Yeol’s vampire nature from Hye Ryeong, she confidently confirms that her love for him would never change. Yet when she witnesses Sung Yeol taming another vampire and drinking blood in action, she suddenly becomes scared of him and cowers away. Unfortunately, such dramatic shifts in characterization really took me out of the drama and leaves me little to respect for Yang Sun as a character. 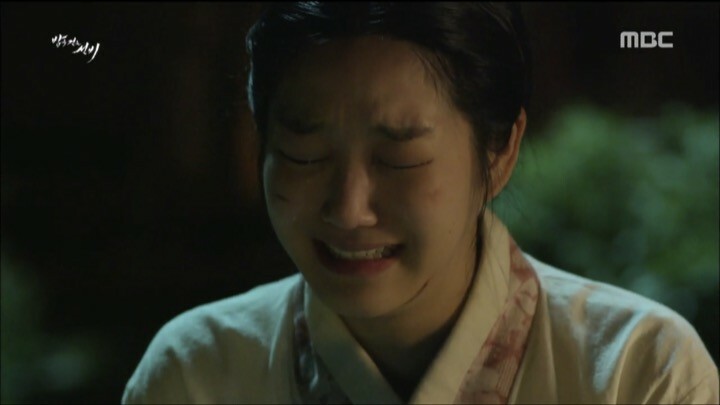 In these two episodes, Scholar Who Walks the Night becomes briefly entertaining again thanks to the new attempt at defeating Gwi since the discovery of the purpose of Yang Sun. The fierce battle ensues as Gwi is eager to destroy her and Sung Yeol is keen to save her. Besides the intensity of the fight itself, another highlight is the actual use of Yang Sun that proved to be quite a surprising and interesting twist. Of course, Gwi cannot be wiped out so easily and lives to see another day. Meanwhile, because Yoon joined hands with Sung Yeol, his rebellious intentions towards Gwi is made known. 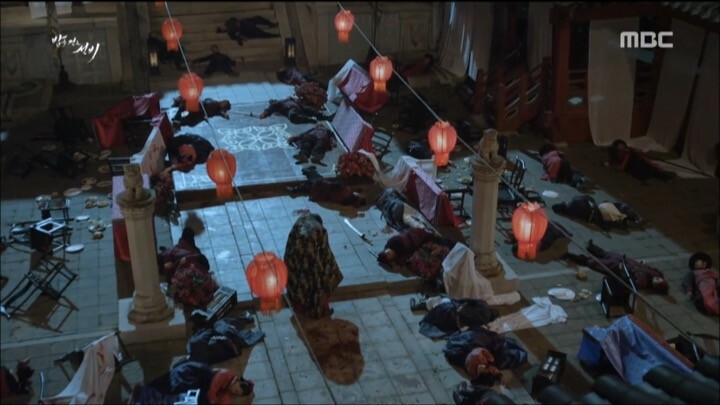 During the aftermath of the unsuccessful duel, Gwi banishes Yoon from the palace and seizes the throne himself. Yoon barely manages to survive thanks to Hye Ryeong’s negotiations with Gwi. With the hero party greatly weakened and Yang Sun turning out to be a double-edged sword that’s unlikely to be used again, I wonder how the drama will be able to produce a satisfying solution in bringing down Gwi. 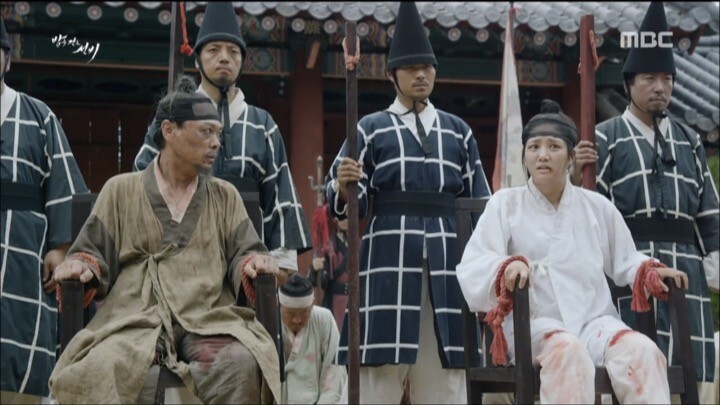 As I have feared, the ending of Scholar Who Walks the Night is as disastrous as it can get. I won’t even get started on the crawling pace of the drama and the nonsensical actions Gwi takes once he became king, as I’ve come to expect such things at this point. Nor will I lament the pointlessness of the drawn-out debate between Gwi and Sung Yeol on who’s doing the humans a favor just to fill time. I’m just going to point out that the way Sung Yeol and Yoon destroyed Gwi was so ludicrous and forced it made me question why even bother with the previous plot of prince Jung Hyun’s journal and the birth secret of Yang Sun at all. Had this final method been used, Gwi would have been extinguished 120 years ago. I suppose with great expectation comes great disappointment. Scholar Who Walks the Night had such promising potentials with a talented cast of actors, fascinating premise, and amazing cinematography to showcase the elegance of Joseon dynasty. Yet the incongruent and unoriginal writing sadly turned it into a hollow beauty at best. but they never explained or showcase in the drama how Gwi became a vampire? That’s what I have been trying to know!